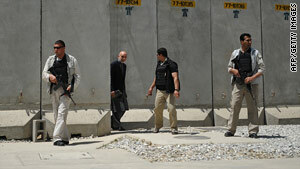 Afghan President Hamid Karzai visits the heavily fortified Bagram Air Base on May 8. Taliban spokesman says 20 armed men in suicide vests stormed base in "major firefight"
Kabul, Afghanistan (CNN) -- Seven insurgents were killed when a group of more than a dozen men launched an early morning attack on Bagram Air Base in Afghanistan on Wednesday, officials said. Army spokesman Lt. Col. Clarence Counts said that five service members were wounded in the attack and a building suffered minor damage. He said the attack included rockets, small arms and grenades. Taliban spokesman Zabiullah Mujahid told CNN that 20 armed men wearing suicide vests stormed the base around 4 a.m. (7:30 p.m. Tuesday ET), with four of them detonating explosives at the entrances to allow the other men to move in. Mujahid said that a "major firefight" took place inside the base. But Army Specialist Christina Dion, a spokeswoman who both lives an works on the base, told CNN that personnel were ordered to enter bunkers when the base came under attack and were allowed to return to their huts and tents about 90 minutes later.